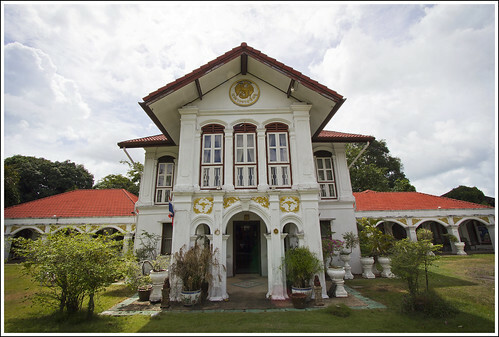 The last update on the Phuket weather blog was 15th August. Well on the 16th it was cloudy and there was some rain in the night, hardly any on my house, but certainly some in Patong, which may have contributed (by causing an electrical short) to a tragic early morning (after closing time) fire at the Tiger Disco, in which 4 people died. 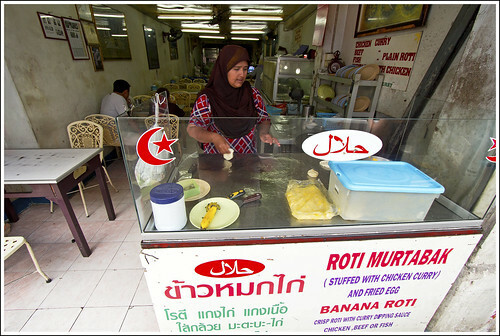 And then had lunch at Abduls Roti Shop on Thalang Road. It's the Phuket weather radar! I've never been up this hill before. Views were OK, though the hill is covered in trees. 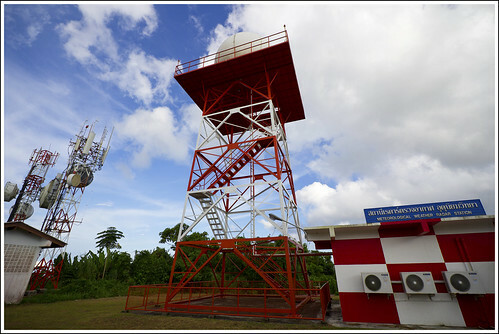 Would need to climb up the radar tower to get a better view (I didn't). Monday 20th was largely sunny, but then overnight there was a big downpour. 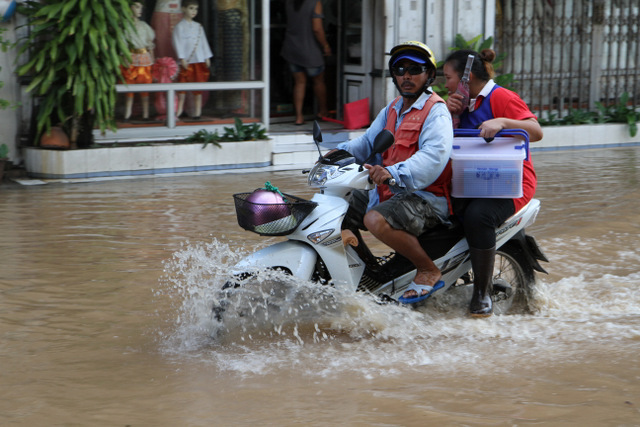 I measured 86mm, most of which fell overnight and surely helped a bus to flip over on the main road to the airport in the wee hours. It was quite a wet day at Karon Beach too, though at my house in Kathu it had been quite dry. Rain can be very localised. OK, saving the best for last! Well, last night was wet. Really wet. It rained all night. I was shocked by the reading on my rain gauge for the period from 7am 21st - 7am 22nd August, a total of 210mm of rain! That's more than I can remember in a single day** and I figured there would surely be some flooded roads somewhere. 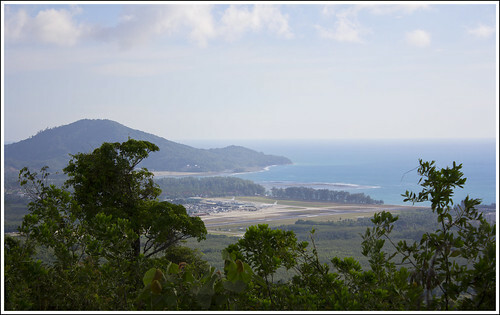 Surprised that my 20km drive to Karon Beach was flood-free, but I soon heard about wet roads in Phuket Town and Patong and some flight delays at the airport. Nothing real serious. I don't like to say "floods" as people tend to overreact. 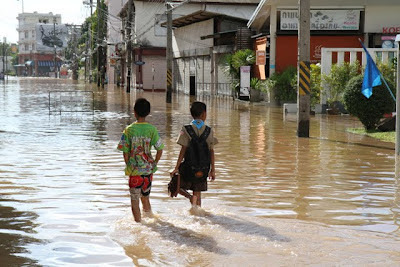 There was water on some roads, it slowed transport, made some houses and shops wet, but it never lasts long. Mostly all drained away during the day. Photos below from The Phuket News. 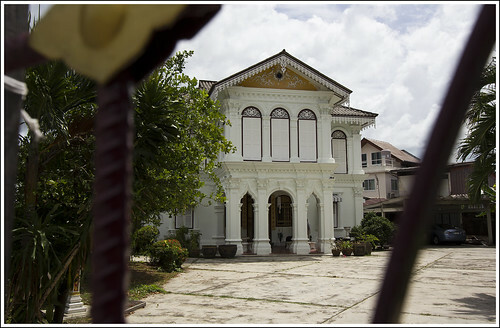 First one on Dibuk Road in Phuket Town this morning. My wife drove on that road at 5pm and there was no water. So it drains off fast, looks dramatic, but in reality, the locals just take it with a pinch of salt. 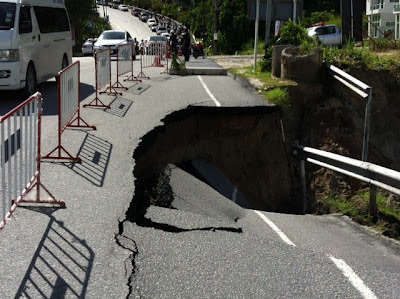 And the same piece of road that had a sinkhole problem last year collapsed again on the edge of Patong Hill (the road leading over to Phuket Town and Kathu). Guess they'll fill it in with gravel again. Hey, nothing too serious, and I think all gone now. In fact, today was mostly sunny, a nice warm day. Water drains off Phuket quickly into the sea. Let's see what happens the rest of this week ... Must be some more rain to come. ** Looking back through old rainfall data. October 9th 2004, over 300mm was recorded - not by me, but by the guy I got the rain gauge from. So yesterday/last night was not the wettest day I have ever seen. In 2004 I was doing some weather updates on our dive shop page, and at that time I wrote "Really wet day. Heavy rain and minor flooding in some areas. Where's my ark?". Cheers and do follow me on Twitter for daily updates.